The latest round of community voting in The Hackaday Prize asked a simple question: which project is most likely to save the planet? The results will be posted on Monday. Now it’s time to see if we’re giving away a $1000 gift card to the Hackaday Store, or just some prizes to people who have voted. The rules here are simple: I’m randomly selecting one person on Hackaday.io. if and only if that person has voted in the latest round of community voting, they get a thousand dollar gift card to the Hackaday store. If the randomly selected person did not vote, I select three people who have voted in the latest round of community voting. For the last few weeks, we’ve been giving out t-shirts. To sweeten the deal, we’re giving away a SmartMatrix, A Simon Says kit, and an Analog Stepper gauge to three people, just because they’ve voted. Drat, the Hacker number randomly selected for the $1000 gift card hadn’t voted! Oh what could have been. Don’t let this happen to you next week, VOTE! 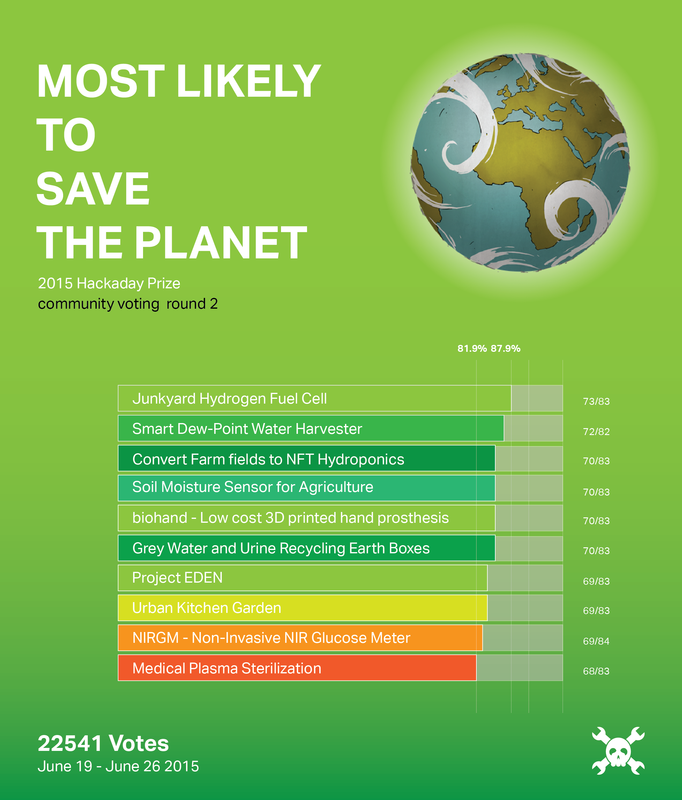 We’ll have to do some math and run a few scripts to figure out which projects the Hackaday.io community deemed most likely to save the planet. Until we put that data together, it’s time to start a new round of voting. This week, we’re looking for projects that are Amazingly Engineered. Next Friday we’ll select a random person on Hackaday.io, and if they have voted, they get a $1000 gift card! For the apathetic non-voters… nada. No, no one won this week. That’s okay, because we’re giving t-shirts away to three random people who did vote. This week, [cgapeart], [Jeff], and [devonelliott] are getting t-shirts from the Hackaday Store, just because they were cool enough to vote. We’re going to keep this round of community voting going for another week. Everyone registered on Hackaday.io gets 50 votes for each round of voting, and every Friday (around 20:00 UTC), we’ll randomly select one person registered on Hackaday.io. If that person has voted, they get a $1000 gift card for The Hackaday Store. If they haven’t voted — a t-shirt. They’re nice t-shirts, but I’d rather have the gift card. All you have to do for a chance to win a $1000 gift card is head over to the Community Voting Page and pick which project is most likely to be widely used. There’s no wrong answer; all you have to do is decide between two projects. If you only use up one vote, you’re in the running for a $1000 gift card. I’ll be doing another round of random, fair die rolls and SQL queries next Friday. Until then, VOTE!